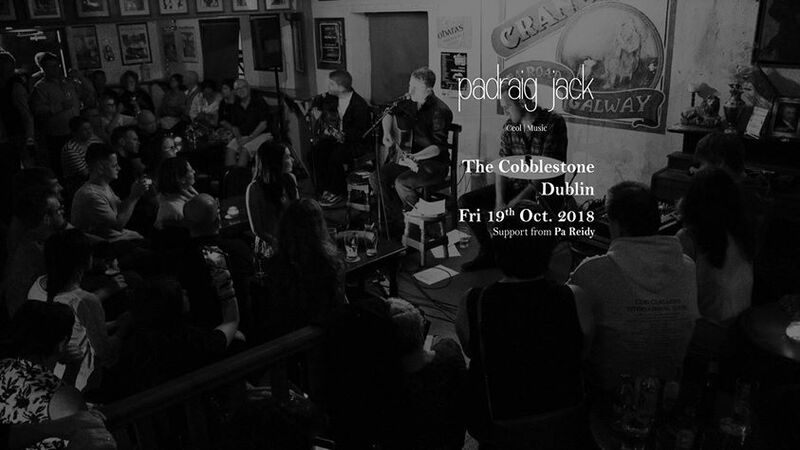 Aran Islands bilingual singer-songwriter Padraig Jack will play a concert in Smithfield’s The Cobblestone Pub, Dublin on Friday October 19th for his first show in Dublin since his latest sold out concert in Galway’s Crane bar in summer of 2018. He will will have a full band on the night and will be supported by Co Clare songman Pa Reidy. After a busy 2017 which saw him wow audiences at packed headline shows at the Westport Bluegrass Festival and the Castlebar Wild Atlantic Words Literary Festival, Padraig Jack also debuted his soulful, bilingual music was at County Down’s Soma Festival and at Belfast’s Liú Lúnasa Festival as well as at Electric Picnic. Having played support for the Saw Doctors and Mick Flannery and bagged numerous NÓS Music Award nominations in his short career so far, 2018 has so far seen Padraig win 2nd prize at the prestigious Pan Celtic Song competition for his song “i bhFostú sa bhFiántas” and he made his RTE 1 TV debut where his music featured in a documentary on the Irish language. Padraig has been spending time in London recently making a record with John Reynolds, Reynolds has worked with Sinead O’Connor, Damien Dempsey, Brian Eno and Indigo Girls. The record will be released in the new year and he will be playing some new material in the The Cobblestone. Padraig’s band on the night will feature some members of Galway band Rofi James and his brother Cathal Jack and support will be from Clare songman Pa Reidy. Doors are at 8.30pm admission is €10. Beidh amhránaí dáthteangthach Árainn Padraig Jack ag cur ceolchoirm i láthair sa Cobblestone Pub ar an Margadh na Feirme, Báile Áth Cliath at Dé hAoine and 19ú Deireadh Fómhar, seo é a chéad seó aige i mBÁC ó dhíol sé amach an Crane Bar i nGaillimh sa samhraidh 2018. Tar éis blian gnóthach i 2017 nuair an sheinn Padraig ag an Féile Bluegrass i gCathair na Mart, Caisleán an Bharraigh, Caisleán Uidhilín ag SOMA agus Liú Lúnasa i mBéal Feirste agus Electric Picnic, d’oscail sé do na Saw Doctors agus Mick Flannery. Bhuaigh Padraig an dara duais sa comórtas Pan Ceilteach i 2018 agus bhí sé ainmnithe le cheithre gradam ceol NÓS agus bhí amhrán leis (Brú Do Bhealach Féin) craolta ar RTE 1 teilifís. Tá Padraig ag taifeadadh EP ceirnín nua i Londain faoi láthair le léiritheoir John Reynolds. Tá súil aige an ceirnín a chur amach go luath i 2019 agus beidh sé ag seinm cuid dá cheol nua sa Cobblestone. Beidh banna ceol leis ar an oíche le beirt lads ó banna Gaillimhe Rofi James agus a dhearthair Cathal Jack. Beidh fear condae an Chlár, Pa Reidy ag tabhairt tacaíocht ar an oíche freisin. beidh na doirse ag 8.30 agus ta táille €10 ar an doras.